With the release of OS X 10.7 Lion Apple made significant changes to the structure and permissions of various important folders. For example the Library folder in the user’s home folder is now hidden. A consequence of this is that on Lion (and all versions after that) older versions of MacVector do not have the correct permissions to create the required MacVector License folder (Snow Leopard and earlier are fine). 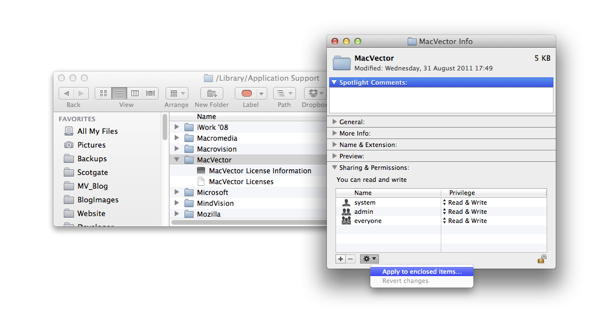 Note that only MacVector 9.5 and later will run on Lion. Much older versions will not run. With the release of Mavericks this situation changed further. You must be running MacVector 10.5 or later. You cannot activate a license with MacVector 10.0. For Mavericks all versions before MacVector 13 are affected. Make sure you are logged on as an administrative user. Find the folder /Library/Application Support/ This is the shared “System” /Library/ folder on the startup hard drive, NOT the /Library/ folder in your home folder. The easiest way is to open a Finder window, select the “Go->Go To Folder” menu item and type or paste “/Library/Application Support” into the dialog that appears (without the quotes). – If the folder is present check that it is writable and not read only. Also ensure that the contents are also writable. – If the folder is not present, then create the folder and make sure it is writable. – Select SHARING AND PERMISSIONS and ensure they are the same as the screenshot below. Now try reactivating the license. If this does not work then please contact Support@macvector.com. This entry was posted in Support and tagged OSX. Bookmark the permalink. Both comments and trackbacks are currently closed.